Our shop tour was a huge success. 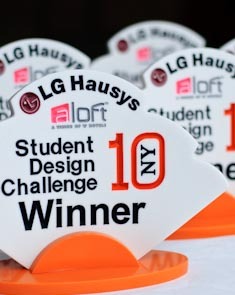 The 5 LG Surfaces Student Design Challenge finalists, Benjamin Fullerton, Mallory McGaughy, Sergio Mondragon, James Petras, and Lily Zhang, loved getting their hands "dirty" with solid surface. In addition to our friends from LG Surfaces, Mike Tasch, Ferron Dunham, Christal Gress and Haley Davison, we were also pleased to have such honored guests as Glenn Ramussen - Gensler, Chris Crowell - Hotel World Network, Kelly Gaddes - FRCH Design, Katie Gerfen - Hanley Wood, Matthew Ward - BLT Architects, and Clodagh - Clodagh Design. The afternoon began with a presentation by Sterling Surfaces General Manager, Grant Garcia, on the endless design possibilities of solid surface. The guests were then divided into groups for the shop tour. 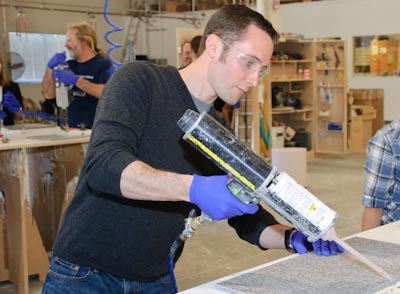 5 stations were set up throughout the shop demonstrating thermoforming, CNC machining, mould and form making, seaming, and finishing. We would like to thank everyone for coming, and a special thanks to the team at LG Surfaces for sponsoring such a successful event.